Book To Rent Ads in Indian Newspapers Instantly Online! 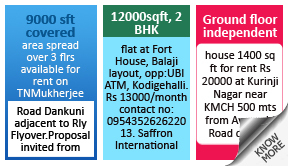 Why Book To Rent Ad in Newspapers? 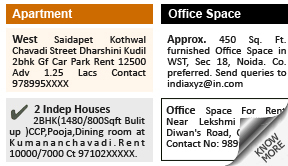 How to Book To Rent Advertisement In Newspapers? Q. I want to rent 2 floor (1st & 2nd - 1000 sq. ft each ready to move) at Dunlop on road without Broker. For office type only. Give me the quotation and suggestion for immediate response. Q. I intend to publish a classified ad consisting of limited words to give a property on rent in Delhi, how to go about it? Q. I want to place two bed room flat on rent suggest simple add.